Plan ahead for your success! When you effectively plan ahead you are more likely to reduce stress, execute new projects, reach more goals and fulfill your vision. Take better care of your day-to-day life when you are able to see all of your important events, assignments, deadlines and special dates coming up, at a glance. We have designed dry erase planning products to help you in every area of life, whether in the office, classroom or at home. Any organization will greatly benefit by utilizing our re-usable products for years to come. For best results use our dry erase products with WET ERASE MARKERS. Wet erase markers will prevent accidental erasing because it is semi-permanent and will also prevent ghosting which will lengthen the lifespan of your purchase. We have the perfect planning solution for all of your needs in a wide variety of sizes and selections. All of our products are backed by a lifetime warranty and are proudly made in the USA! Wet Erase Markers - Wet erase markers are made for our lamination material and won't cause ghosting. White Board Planner - This calendar poster would be a great addition to your family command center, office, classroom, dorm hall, break-room or gym. Extra Large Organizing Supplies - Never forget what is on your schedule again! Great for school assignments, chores, sports practices and games, recitals, vacation time, holidays and more. 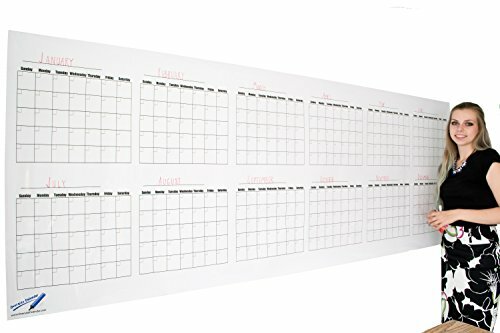 Laminated Whiteboard Calendar - When you have this huge calendar on your wall it will be hard to forget those upcoming important dates and events. Manufactured and Designed in The USA - We take a lot of pride in creating quality products. Add this item to your cart with confidence in knowing that we offer you a lifetime guarantee. If you have any questions about this product by Oversize Planner by ABI Digital Solutions, contact us by completing and submitting the form below. If you are looking for a specif part number, please include it with your message.